The Secret to Keeping Kids Rooms Clean and Organized! The most multi-functional piece of furniture in the house. 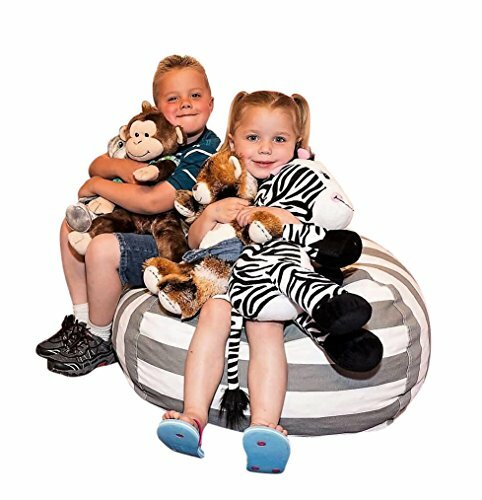 T-Bugs bean bag chair for stuffed animal storage is the perfect solution for kids of all ages. Made from durable easy to clean 100% cotton canvas fabric with built in handle and extra long zipper for easy access. Modern versatile storage solution for stuffed animals, pillows, blankets, extra towels, sheets and clothing. Best alternative to stow away containers, pet nets, stuffed animal nets, toy nets, toy hammocks, boxes, baskets and bins. Stylish solution to help keep rooms neat and clean. Click the "Add To Cart" Button above and start organizing today! STUFFED ANIMAL STORAGE SOLUTION for kids room provides a modern, comfy way to clean up and declutter all those plush toys. KIDS WILL WANT TO CLEAN UP THEIR BEDROOMS with this fun bag. The fuller, the better! FUNCTIONAL BIG BEAN BAG CHAIR holds approximately 50 - 60 various size TOYS, BABY ITEMS, TOWELS, extra BLANKETS, and CLOTHING. Perfect for small places. STRIPED PATTERN ORGANIZER PROVIDES A BETTER ALTERNATIVE to storage nets, toy hammock, storage boxes, cabinets, bins and toy boxes. PERFECT BEAN BAG COVER for boys, girls, baby, teens and adults. NO FILLING, NO BEANS. FILL IT UP WITH HOUSEHOLD ITEMS! Makes a comfortable chair, lounger, pillow, video chair, seat or lounge chair for kids room, for closet, for corner, on bed. Prime solution for under fifty dollars! If you have any questions about this product by T-Bugs, contact us by completing and submitting the form below. If you are looking for a specif part number, please include it with your message.